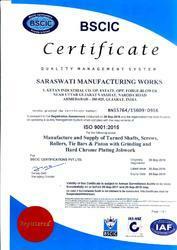 Established in the year 1969, we, “Saraswati Manufacturing Works”, are an illustrious ISO 9001:2015 certified manufacturer and supplier of Shaft Roll & Screw. The products we offer are highly applied in the manufacturing of Hard Chrome Plated Roller, Industrial Aluminum Roller and Teflon Coated Roller. Our products are stringently checked by the professionals on parameters like corrosion resistance, durability and tolerance, to name a few. We are a Partnership firm, which is based at Ahmedabad, (Gujarat, India). Our firm is efficiently managed by the team of professionals, we have appointed. They implement suitable management policies that help us to execute all the business operations in a streamlined order. All our trade activities are carried out proficiently at the contemporary infrastructure, we have developed. Our products are used in the manufacturing of Cable & Conduct Plant, Fish Net Machines & Turbine Pump & Machinery. Under the visionary guidance of our mentor, “Mr. Dipesh Shah”, we have achieved a commendable status in the market. His scintillating business skills, in-depth knowledge and constant motivation have paved the way to tremendous success for us. We consider our adapt team of professionals to be the biggest assets of our organization. They leave no stone unturned in designing our range of tubes, pipes, plates and allied industrial components with premium quality. Our firm has recruited a blend of young and experienced individuals who form our core team. The team pf professional appointed by us works in a cohesive environment that helps carry out all our operations and methodology in a dexterous manner. They consistently endeavors to ensure long-term growth through the development of our range with unparalleled quality and at economical price. Backed by advanced technology coupled with dedicated professionals, we have been able to carve a niche for ourselves. Along with this, each of the products manufactured by us are in compliance with industry quality standards. Owing to varied other factors, we have been able to gain an edge over our industrial counterparts. We are iso certified manufacturer and supply of Turned shafts,Screws,Rollers,Tie Bars,Piston with grinding and hard chrome plating job work.